Did anyone pre-order from AT&T and check their order status? Discussion in 'iPhone' started by XMike17, Oct 7, 2011. Mine says "Backordered", is that just what they put for everyone because the iPhones aren't in stock yet? yep thats what mine says too. From what I remember from pre-ordering from AT&T last year, that status is normal. 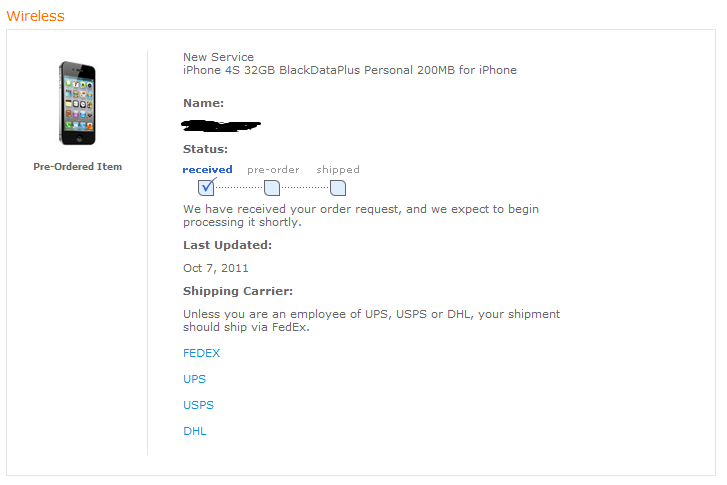 It says backordered because they don't have the phones on-hand yet. Apple waits until later to avoid premature deliveries. Just called and it is telling me backordered as well. I ordered mine from Apple and my wife's from AT&T. Same as last year because of the site problems. I had backordered last year at the beginning too. This year is the same. And my Apple order says processing. Same as last year. So hopefully all goes smooth for all of us. My order email says I will receive the iphone on Oct 14th. This is the same process as last year so far. I just checked my order and is says " Qty. Back-Ordered: 1". It also states that the order is pending shipment. AT&T also just sent me an email saying "We have processed your order and it has been sent to our warehouse for shipment". Hmm mine is saying "In Process" so not sure what that means if everyone elses says backordered. I never knew ordering through AT&T would be so much easier than Apple. I may have to switch it up & go that route from now on. I clicked on the "status of your order" link from the confirmation email and mine says "Status: Received" Underneath that it says, "We have received your order request, and we expect to begin processing it shortly." I can't get my status to show up from that link either. I went to my account, clicked "my orders" tab, & checked it from there! Edit: That is from my premier Order Status that I placed this morning. I also have one on the regular AT&T site from last night, that shows no status. So I might end up with two phones by mistake! Mine actually has the "pre-order" box checked. The other link says back-ordered though like with other people. I can't anything to show up on there either. I get this instead "E0019: No order was found." Did you try searching with both your order number and your phone number? Edit: Nevermind, looks like you guys are accessing your orders directly through your accounts. This is exactly what I see. yup. i just checked my credit card and nothings been charged yet. i'm guessing i'll get charged once the iphone is shipped?